Travelling north or south and crossing between Scotland and England? We'd love to meet you - why not stop for a visit? 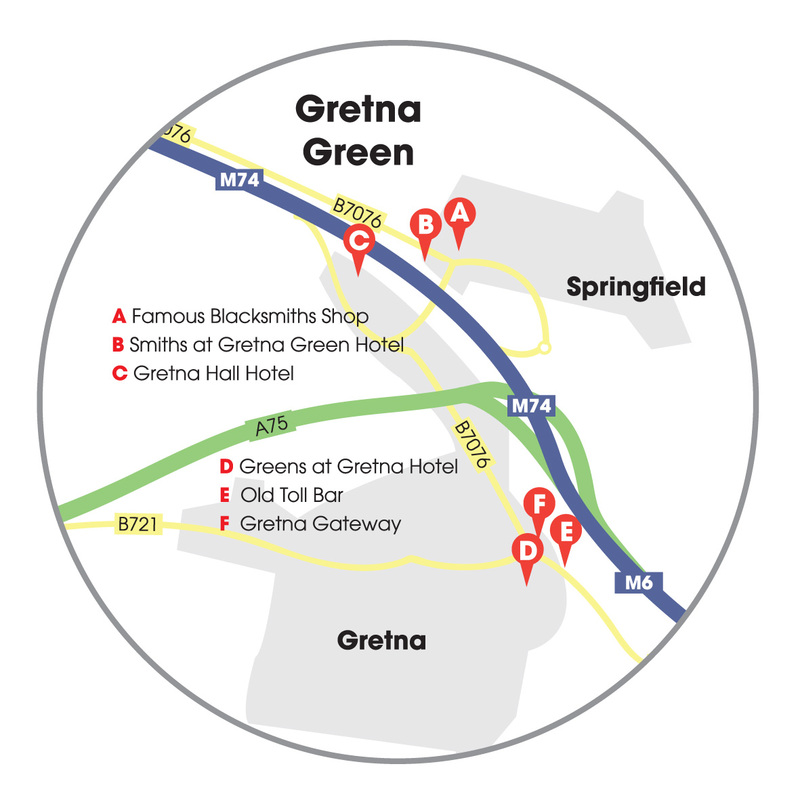 Gretna Green and the Famous Blacksmiths Shop attractions are only 2 minutes travel time from the main motorway route into Scotland (M74) Junction 45 heading North and Junction 22 going South. Located only 10 minutes north of Carlisle, one hour from the Lake District, 1 hour 30 minutes from Glasgow, Edinburgh or Newcastle and 2 hours 30 minutes from Manchester or Stranraer. When is Gretna Green open? How much is parking at Gretna Green? It doesn't cost anything to park at the Famous Blacksmiths Shop Gretna Green. FREE parking is available on site (Management cannot accept responsibility for loss or damage to property or vehicles). From the M74 or A75. Come off at the Gretna (Gretna Green) junction and follow the brown tourist signs to the 'Old Blacksmith's Shop Visitor Centre'. From M74 going North take Junction 45, going South take Junction 22. 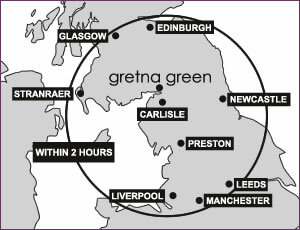 Trains from Carlisle and Glasgow stop at the Gretna Green station. We are a 5minute walk away. We are 90 miles from Glasgow Airport, 70 miles from Newcastle Airport and 150 miles from Manchester Airport. Leave the motorway at junction 22, follow the Blacksmiths Shop signs turning left at the roundabout. Go straight on through the village and turn right into the Famous Blacksmiths Shop Attractions. When you leave the motorway, follow the signs straight across the mini roundabout, straight ahead at the traffic lights and then at the bottom of the hill take the right turn opposite the church in Gretna Green. Head on up the hill, below the motorway flyover. The Famous Blacksmiths Shop will be facing you on the opposite side of the T-Junction. Take the slip road off (for Gretna/Gretna Green) before joining the M74. Follow the brown tourist signs, turning left at the traffic lights. At the bottom of the hill take the right turn opposite the church. Head on up the hill, below the motorway flyover. The Famous Blacksmiths Shop will be facing you on the opposite side of the T-Junction.